Sports Costs > How Much Does a Trampoline Cost? Trampolines allow you to exercise, stay fit, and at the same time, have fun. Not only will it be loved by kids, teens and adults can enjoy it too. 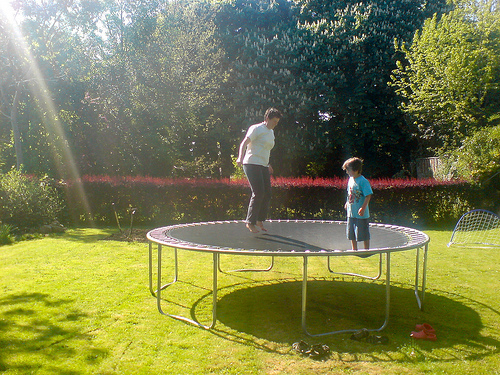 The cost of a trampoline will depend on the type, brand, size and where it’s purchased. On average, a full-size outdoor trampoline is going to cost anywhere from $200 to as much as $2,100. However, most purchases will be within the $200 to $500 range. For instance, a 12-foot round trampoline costs $200 to $1,100 if purchased with an enclosure. A 16-foot octagon trampoline can cost $700 to $1,400 if purchased with an enclosure. An 8×8’ square trampoline can cost $300 to $1,000 (with enclosure) while a 9’ x 15’ rectangular trampoline costs $1,500 to $2,000 with an enclosure. Smaller trampolines that are used for exercise can retail for $50 to $120. This low-cost Ultega Jumper Trampoline retails for $330 to $450 on Amazon, for example. The popular My First Trampoline retails for $100 to $150. At Trampoline.com, for example, a 16.5-foot air trampoline retails for $1,495, while a 13-foot Big Wave trampoline retails for $1,695. Lastly, an in-ground trampoline, if you were to have it installed by a professional contractor, would cost about $5,500 for the material and install. If you were to just purchase the kit, then the costs would be about $1,500 to $3,000, depending on the size. On LiveLikeYouAreRich.com, they were quoted $1,500 and $2,000 for the install only. Trampolines include various shapes, sizes, and specifications or features, but most trampolines will be round, square, oval, octagon, or rectangle. Common sizes will include 10, 12, 13, 14, 15 and 16 feet. Exercise trampolines, however, are a standard 40 inches in diameter. Trampolines will vary with its weight capacity and square footage. A standard trampoline can include a square heavy duty 12 gauge galvanized steel frame with a structural capacity of 1,500 pounds and 100 square feet of jumping space. It can be used with or without water. Typical packages, when purchased straight from the box, will include the jumping surface, usually made of canvas; the spring cover, which is a pad that goes around the outside of the trampoline to cover the springs and prevent injuries; an enclosure, which goes around the trampoline, about 5 feet tall, made to prevent children from falling off the trampoline; and a top rail that is padded to prevent injuries to the head. Aside from the basics, some companies may include a ladder, cover and/or a surrounding mat. Some of the newer trampolines are made to encourage kids to jump in the middle, which is the safest place to jump. There may be a target shown in the middle and underneath will be a device that lights up when it is hit. Warranties, depending on the company you purchase from, will range anywhere from two years to a lifetime. Be sure to check the paperwork to see what kind of warranty comes with it. Extra costs may be required for shipping or delivery especially when you purchase your trampoline online or from other states. Additional costs may also be incurred for the purchase of accessories such as boards and nets as well as maintenance of the trampoline. Most trampolines won’t come with an enclosure. A bounce board, for example, retails for $99, while a wakeboard and snowboard can cost $200 each. A safety net can start at $200 while a trampoline basketball set can retail for $50 to $150. Ladders to get onto the trampoline can retail for $25 to $50. If you purchase from a local retailer, then you will receive the box with all of the inclusions noted above. If you don’t want to install it on your own, then a professional handyman will be needed to complete the job. Most trampoline assembly jobs will cost about $100 to $150. In the future, parts may need to be replaced. For instance, the mat, which tends to wear away with weather and use, can cost $35 to $80, depending on the brand. Other parts may include the springs or netting. Talk with your homeowners insurance company before getting a trampoline. By adding a trampoline to your yard, this is going to increase your monthly premiums due to increase liabilities. Trampoline insurance, as it’s often referred to, can add another $50 to $150 to your annual premium. Even though trampolines seem to be quite heavy, the wind is capable of taking the trampoline and blowing it across the yard. Make sure you secure it somehow. When purchasing, pay close attention to the weight limit and determine if it will be enough for those using it. Watch out for special discounts and promos of trampolines online or in stores near you. It doesn’t hurt to research at least three retailers before purchasing. While purchasing a trampoline second hand can save you money, always make sure that you know of the condition. A faulty trampoline can cause a lot of harm if parts fail. Look for deals on trampolines in the winter since it is often considered the off season.